Much like an inhaler, the novel GM Ebola vaccine will be delivered through a special “breathing device” that anyone can pick up and use without a doctor’s help. It’s made from a common respiratory virus known as human parainfluenza virus type 3, or HPIV3, that scientists artificially engineered to contain genes from the Ebola virus. 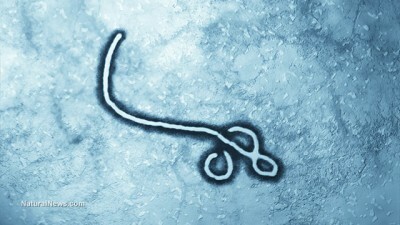 These genes purportedly encode the proteins of Ebola virus on the outside of the HPIV3 virus, prompting an immune response. Researchers publishing their work in the Journal of Clinical Investigation say the vaccine has already been tested on six rhesus macaques, whose respiratory tracts were deliberately infiltrated with the GM virus. One month later, these same monkeys were injected with a dose of Ebola virus that was 1,000 times higher than the level that would normally kill them, but they survived. The GM virus in the vaccine apparently replicated in the monkeys’ respiratory tracts upon inhalation, which in turn caused their cells to produce multiple copies of the Ebola virus’s coat. Recognizing the resultant end product as a foreign invader, the monkeys’ immune systems attacked it, which researchers say is an indicator of success. They’re now testing this experimental GM Ebola vaccine on a small group of humans in the next step towards eventual commercialization, with the National Institutes of Health (NIH) leading the Phase I trial. The goal is to confirm the safety and efficacy of the vaccine, which they expect to undergo another three years or more of safety testing. The researchers involved with the study claim the vaccine doesn’t show any signs of harmful side effects, but time will tell whether or not this is actually the case. The unmitigated replication of a genetically engineered virus inside the body can’t be a good thing, even if the body supposedly recognizes it as foreign and attacks it. This particular vaccine also works differently from other vaccines in that it targets two types of immunity – “local” and system-wide. Local, in this case, refers to the immunity present in the mucous membranes of the respiratory tract, while system-wide immunity refers to the gamut of immune cells that normally circulate throughout the body. How this alteration in immune stimulation will affect humans in the long term is currently unknown, though researchers don’t seem all that concerned about the potential for major autoimmune effects. Their only focus, it seems, is to rush this GM Ebola vaccine to market as quickly as possible and to make it as easy as possible for people to receive it, particularly in poorer areas of West Africa. As with any aerosol-based vaccine, there’s also the potential for viral spread beyond the individual to whom it’s being administered. Like with live-virus influenza vaccines, virus “shedding” is a serious concern, as is the threat of a GM virus spreading like wildfire throughout a population and potentially causing an outbreak of disease.